The 2019 Gymnastics and Dance Display was the most successful it has ever been with over 70 boys and girls from Prep 4 to Form IV involved in either performing routines, stage crew, sound, lighting or photography. This is the 17th annual display that Mrs Verity Smith has produced and it continues to celebrate the gymnastics and dancing talent of the Dollar Academy pupils. 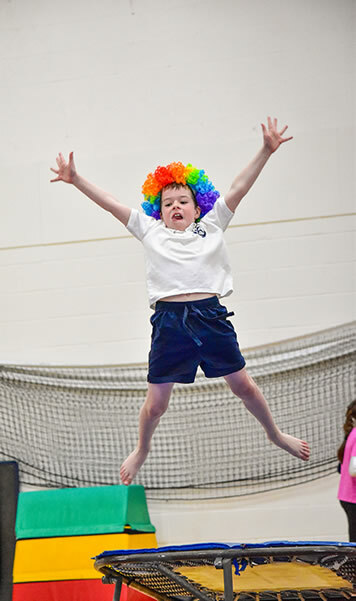 The show started off with a flurry of colour and energy as Prep 4 and 5 performed their highly entertaining “Afro Circus” routine. Lucy MacDonald (J1) performed her solo floor routine and was outstanding, showing exactly why she won the National Level 4 Qualifier earlier this year. Solo floor, ballet, tap and contemporary routines were also performed to a very high standard by Jess Glasgow (FII), Lucy Laing (J1), Grace Mclaren (FII), Cary Jennings (FII) and guest performer Amelia Griffiths (Gap Student). There was also a spectacular mix of floor, vaulting and apparatus pairs on show, together with some Highland and Hip hop dances. Many of the performers really wowed the audience with their more complex skills which they performed with ease, including Tyler Hunter (FI), Angus Crockett (FI), Michael Jack (FI), Clara Pillans (FI), Molly Kershaw (FI), Katy Hynd (FII) and sisters Sarah Nicol (FII) and Laura Nicol (J1) who performed a fantastic pairs routine. Above all, what came across in all of the routines was real enjoyment, hard work and confidence as the performers showed off their talent in front of a very large audience of parents, friends and family. Special mention to Jacob Timney (FIV), Wilfie Timney (FII), Emily Norval and Darcy Duguid (FI) for their excellent photos, sound and programme design respectively.